Complement your light and airy décor with this wonderful TV stand. 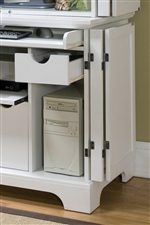 It comes with an open storage area that includes an adjustable shelf. The unit is made from hardwood solids and wood product with a multi-step white finish including a clear coat finish to help guard against wear and tear stemming from normal use. Utilize the top of the entertainment stand for your flatscreen television. Watch your favorite shows with a few of your best friends using this wonderful unit. The Naples Classic Entertainment Stand by Home Styles at AHFA in the area. Product availability may vary. Contact us for the most current availability on this product.